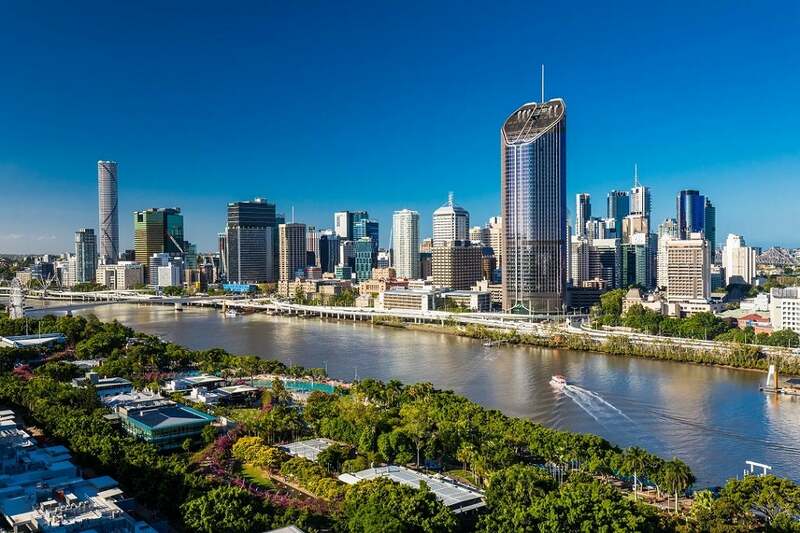 Brisbane used to be dismissed by many Aussies as just a big country town, but in recent times the capital of the Sunshine State has become a thriving and exciting place to live. The city has outgrown its country roots and turned into a cosmopolitan center of many different cultures, offering a vibrant environment for young professionals and families alike. Think Sydney and Melbourne but smaller and more affordable. The nickname ‘Brisvegas’ has always been a little ironic, for Brisbane has never been known for its nightlife, but things change. With a population of 2.27 million, Brisbane is now one of the fastest growing cities in Australia. If you’re thinking of moving there from the US, here’s all you need to know about the city before you move. NB: all prices listed are in USD ($). If you think Texas is big, you should see Queensland; it’s 2.5 times larger. Brisbane sits in the southeast corner of Queensland, the northeastern region of Australia that has been affectionately nicknamed ‘the Sunshine State’. It’s justified, too, with 263 sunny days per year on average, more than any other Australian state. Brisbane’s geography is pretty distinct: a great river running through the middle, a hilly centre and floodplains stretching across the Greater Brisbane area. The city was established in 1824 on the bend of the Brisbane River, and it’s safe to say that the Brisbanites have seen a few major floods. The most recent was in December 2010 and Brisbane’s flood defences have improved continually since then. Fortunately, Brisbane has been dealt a much better hand when it comes to earthquakes. Seismic activity sometimes occurs but it is rarely strong enough to be felt by the city’s residents. A genuinely destructive earthquake in Brisbane has been deemed extremely unlikely by seismologists. Brisbane sees more of the sun than any other state capital in Australia. The Sunshine State city enjoys 283 days of sun each year on average and that’s not even counting the ‘partly sunny days’. The climate is positively subtropical, with humidity normally peaking at around 65-70% in the summer. As you can see in the table below, the temperature stays pretty consistent throughout the year, ranging from pretty warm to boiling hot. Just as a heads up: if you enjoy your white Christmas in America, be aware that it never snows in Brisbane. The best you’ll get are the rare, light dustings in southern Queensland. Like most major Australian cities, Brisbane has drawn together a wide variety of cultures from around the world, especially those from Southeast Asia. According to population experts ID, 82% of Brisbane’s population are primarily English-speaking. After that, 2.6% speak Mandarin, 1.5% speak Vietnamese and another 1.5% speak Cantonese. The next most spoken language is Italian at 0.8%. You can view the full data here. There’s a bit of practical information you should know about before you start thinking about making the move. It doesn’t matter where in Australia you’re moving to, the visa rules for US nationals are the same. If you’re completely relocating to Brisbane, you’ll probably need a Skilled Migrant Visa, which will allow you to work while you’re out there. Check out our full breakdown of Australian visa requirements for US nationals here. America has a handful of embassies and consulates in Australia but none are located in Brisbane. Your closest port of call would be the US consulate in Sydney, about 900km down the coast. We’ve generated a few estimates of how much it will cost you to move your stuff to Brisbane via shipping container. Obviously the costs can vary significantly depending on the type of move, but this is just to give you a rough idea. The prices are based on a 20ft container of household goods worth $70,000 (source: WorldFreightRates.com). Here’s the fun part! Read on to learn all about what it’s like to live and work in Brisbane. Brisbane’s more serious nickname is ‘Australia’s New World City’. As the nation’s geographically closest city to east Asia, Brisbane has become an important part of both domestic and global trade. If you move to Brisbane today you’ll be joining a city on the rise. The Greater Brisbane economy is worth an estimated $154 billion, and this is only forecast to grow further. The job opportunities in Brisbane are plentiful. Business services are the city’s biggest employment sector, and these include a vast range of industries from HR and accountancy to architecture and design. More specifically, in May 2017 the top three most popular industries in Brisbane were healthcare, professional technical services and retail trade. You’ll find that lots of major national and international companies have offices in Brisbane, such as Suncorp, Aurizon and Domino’s. In a booming city, there are always opportunities for both skilled and unskilled expats. In terms of finding work, newspapers are your traditional option. Try the Brisbane Times and the Brisbane Courier Mail. However, for online resources you can also try the Australian Government Career Information website and popular Aussie job hunting site CareerOne. If you’ve moving with a family then you’ll probably be thinking about the choice of schools and universities for your children. Fortunately, Brisbane offers a very high standard of education. Brisbane State High School opened in 1921 and now serves over 3000 students. It is located on the corner of Cordelia Street in South Brisbane. Indooroopilly State High School is located in the wonderful-sounding suburb of Indooroopilly. There is a hugely varied curriculum on offer, including the mandatory Aerospace Studies. All Hallows’ School is as old as it sounds, basking in a rich history of 155 years. It’s a traditional all-girls school with a dainty white hat as part of its uniform, and annual fees of around $8625 per year. Brisbane Grammar School, on the other hand, is only for boys. With 1700 students and beautifully maintained old buildings, you can choose whether to have your son board there or just go there in the daytime. Annual fees are around the $15,000-$20,000 mark. Griffith University, which ranks in the top 3% of universities worldwide, was founded in 1971 with one campus and 451 students. It now offers over 300 degrees and has 43,000 students. Cop that for growth. Queensland University of Technology tops that by teaching over 45,000 students. This university is a little younger, established in 1989, but it boasts a premium range of technological degrees. The University of Queensland is last but certainly not least. It is the oldest university in the state and ranks 47th in the QS World University Rankings. Australia is blessed with a free (ie. government-sponsored) healthcare system called Medicare. However, Americans aren’t blessed with the right to use it. Expats from countries such as the UK and New Zealand have access to Medicare, but everyone else needs private insurance cover. Have a look here for more information. As with anywhere in Australia, the emergency number is 000. What’s particularly special about Queensland is that all ambulance services are free, whereas in any other state you have to pay for it. There are nearly thirty public and private hospitals in and around Brisbane. View the complete list of hospitals within the Brisbane area here. Have a look at our breakdown of the living costs in Brisbane. We’ve compared the city’s prices to those in New York in order to offer a little perspective. According to Numbeo, New York’s consumer prices are nearly 25% higher than Brisbane’s. To put all of this into context, the average monthly net salary (after tax) in Brisbane is $3,318.49 while in New York it is $5,049.65. Brisbane was a rather well planned city when it was designed, which means the CBD is divided into a simple grid shape. Streets named after English kings (eg. George Street, Edward Street) intersect with streets named after English queens (eg. Ann Street, Elizabeth Street). However, if you don’t feel like walking, Brisbane is well equipped with public transport options. You’ll be pleased to know that in this hot city all the buses and trams are air-conditioned. Translink is the company that operates all of Brisbane’s public transport. If you’re going to be living and working in Brisbane and you won’t be using a car then the Translink Go card is your best option. It’s much more economical in the long term than paying for each individual journey and you can easily top up your card online. 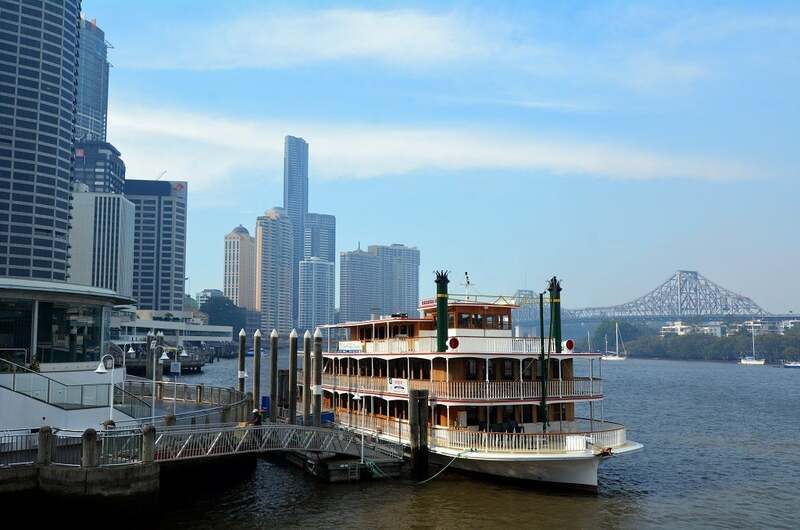 The lifestyle in Brisbane is defined by the river that winds through it, so it’s no surprise that Brisbanites like to use the ferry to get around. The boats operated by Translink are known as CityCats and they’re a beautiful, easy way to get around the city. Brisbane’s buses are clean, sophisticated and simple to use. They are a great way to navigate the central districts if you want something a bit faster than the ferry. Translink also operate a nightbus service (called Nightlink) that runs on weekends after midnight, so you can enjoy Brisbane’s nightlife without worrying about how to get home. The city’s rail system uses electric trains, which means they don’t make much noise and they’re pretty quick. They connect the center of Brisbane to the outer districts, making commuting an easy process for the suburban Brisbanites. The Airtrain service is helpful for Brisbane’s many frequent flyers, as it connects people directly to Brisbane Airport. Brisbane is, after all, Australia’s gateway to Asia. If you’re feeling fit and you want to reduce your carbon footprint, bicycles are a good option. A large network of cycle paths weave in and around the city, so you can easily beat the buses on bad traffic days. You don’t need to own your own bike either; Brisbane City Council have a CityCycle scheme that offers bikes for hire at various points around the center. They provide the helmets for free, though! Speaking of free, you don’t actually need to pay for certain buses and ferries around the city. Two bus routes – the City Loop and the Spring Hill Loop – can be used by Brisbanites free of charge. Likewise, the CityHopper is a free ferry service that operates daily between North Quay and Sydney Street. It’s simple: if you hold a driving license, Australian or foreign, then you are allowed to drive in Brisbane. Fortunately, your commutes won’t be too bad. According to TomTom’s traffic index, Brisbane’s congestion level is only at 28%, meaning it’s only the 96th worst city in the world for bad traffic. You could do a lot worse. Unsurprisingly, Red Hill is built upon some rather steep hills (although they are not red). This is a handy choice of location if you want to live near the CBD (about 3km away), however property is a bit more expensive as a result. The residents of Red Hill are served by many cafes, restaurants and one school, called the Red Hill Special School. According to Canstar, the median house price in the area is $646,808. Long ago, Everton Park (and the nearby Everton Hills) took its name from the cold and rainy district of northwest England. Fortunately, Everton Park is neither cold nor rainy. This area is a great choice if you want an affordable option in the north of the city. It’s particularly family-friendly, with plenty of schools and nice cafes. Canstar give the median house price here as $458,645. Toowong is MoveHub’s choice for Brisbane’s west side. It’s blessed with a very scenic location, nestled between the Brisbane River to the east and the Brisbane Botanic Gardens to the west. The sophisticated, tree-lined houses enjoy close proximity to the Toowong village shopping centre and some excellent pubs, such as the Regatta Hotel. The average price of a house here is $616,231. Corinda lies right on the edge of Brisbane’s southern district. In contrast to the other neighborhoods we’ve mentioned, Corinda is rather small, with a population of only 4,965 compared with Everton Park’s 8,325. The area had humble beginnings as a small community of farmers (the name ‘Corinda’ came from the old local cattle station) but it has since grown into a trendy and reasonably affordable area. Its big parks are a particular highlight for local residents, such as Dunlop Park. The average house here will set you back about $504,118. In the east of Brisbane there’s a lot of repetition going on, what with districts called Carina, Carina Heights and Carindale (yes, a combination of ‘Carina’ and ‘dale’). When Ebenezer Thorne built his estate in the 1850s, he named it after his daughter, and since then the region of east Brisbane has become dominated by her name. Carindale is fairly new, having been founded in 1980, and it is well known for its large, expensive houses and a big shopping centre called Westfield Carindale. A house in Carindale will cost you about $658,568. As the thriving center point of the entire Sunshine State, Brisbane is naturally bursting with things to do and places to see. Obviously the near-permanently great weather means that much of the city’s cultural activity takes place outside. Brisbane is blessed with lots of green space, and did we mention the river? Many tourists choose to climb the magnificent Story Bridge, which straddles the Brisbane River, and it’s absolutely something you should do while you’re there… if you’ve got the guts. In two hours (or thereabouts) you will climb 262 feet above sea level for stunning views of the city and beyond. Speaking of beyond, there is no shortage of things you can do just outside of Brisbane. We’re talking world-class nature reserves. Head east and you’ll hit the Moreton Bay Marine Park, a place replete with incredible sea life. Or head west to the Scenic Rim for a multitude of forests, valleys and waterfalls. However, if it’s too hot to stay outdoors (and sometimes it will be) then there are some great indoor options too. Take yourself across Victoria Bridge and you’ll find the Queensland Cultural Centre on the South Bank. There are many beautiful buildings and places of interest here, such as the Queensland Art Gallery, the Queensland Museum & Sciencentre, and the Queensland Performing Arts Centre. The Brisbane Comedy Festival is a hilarious gathering of the greatest Aussie comics, running from late February to the middle of March every year, and it’s growing continually. It started in 2009 at the mighty Brisbane Powerhouse but is now spread across three venues. Bring your Translink card! The Brisbane Festival, a rather more vague-sounding event, celebrates all things Brisbane in September every year. This is an acclaimed international arts festival in which you can’t move for music, theatre, dance and, yes, more comedy. Over one million people now flock annually to the festival, and in true Aussie fashion it is concluded with a grand finale of fireworks over the Brisbane River. Sport is probably where Australian and American cultures find their biggest overlap. The playing and watching of sport permeates life in Brisbane just as it does in every other Australian and American city. It’s not that you have to enjoy sport in order to live in Brisbane, but it certainly helps. For the active individual, space in which to play sport is essential. Luckily, Brisbane City Council have recognized this and they provide space in abundance! We’ve already covered the river and the bicycle lanes, but there are also twenty public swimming pools and many sports venues open to public use at certain times. On top of this, according to Choose Brisbane there are over 6000 hectares in urban parks and over 8000 hectares in conservation areas. The Suncorp Stadium (40 Castlemaine Street, Milton) houses the Brisbane Roar (soccer), the Brisbane Broncos (Rugby League) and the Queensland Reds (Rugby Union). The Brisbane Cricket Ground (Vulture Street, Woolloongabba) is nicknamed ‘the Gabba’. Along with national and international cricket, the Gabba also hosts the Brisbane Lions (AFL). The Queensland Sport and Athletics Centre (Kessels Road, Nathan) boasts a main stadium of nearly 50,000 seats along with a 2100-seat athletics venue and a beach volleyball complex called The Beach. If you’re lucky enough to be an athlete from the Queensland Academy of Sport then you can train here. Hakataya Ramen (Queen Street Mall Shop + many more) does some seriously good ramen and it’s very popular with Brisbanites. They recently opened a new store in the CBD and it looks destined to grow and grow. Their mega-spicy Karaka-men pork noodle soup is especially delicious. If you go there on your birthday then you can get ramen for free! Gerard’s Bistro (Gerard’s Lane, 14/15 James Street) is the place for Middle Eastern and Maghreb cuisine. While eating there, you’re encouraged to share the menu with fellow diners in a pretty unique banquet-type experience. The choice of food on offer is staggering, ranging from Blackmore wagyu flap and oxheart tomatoes to Morasa polow with Iranian fruit. Jan Powers Farmers Market (Queen Street) counterbalances the international food scene with some proper local produce. It springs up in Brisbane city center every Wednesday with a real attack on the senses, overflowing with bread, meat, fish, fruit, vegetables, flowers, spices, oils and so on. Jan Powers and her long-standing market enterprises are loved by Brisbanites for helping over 300 growers sell their produce. Burger Project (144 Edward Street and Southpoint) might be your saviour. We understand that American expats sometimes need to tuck into some proper American food. Fortunately, in Brisbane you’re never too far away from burger, bagel, wing and hotdog joints. Take the Burger Project, for example. It’s one of those rare places where the photos of the burgers on their website are actually what their burgers look like, and they’re great. In a similar vein, pay a visit to 5 Dogs for some of Brisbane’s best hot dogs. No prizes for guessing what The Bagel Boys are good for. Up on Constance (20 Constance Street, Fortitude Valley) will give you all you need if you’re wanting something classy and chic. This is where the well-dressed Brisbanites go to drink cocktails as the sun sets over the city. The people at Up on Constance really want you to be adventurous with your drinking, which is why their menu is so often updated with exciting new cocktails. Give the ‘Peat at a Picnic’ or the ‘Sunburnt Mexican’ a try. The Met (Wickham Street, Fortitude Valley) describe themselves as “Brisbane’s hottest nightclub”. Well, with a maximum of 5,000 people on a tropical Brisbane night it probably does get a little warm in there. The Met is a three-tiered club perfect for those really looking to party. The website tells you to “lose yourself”, which is exactly what you might do when they turn the lights down. With three different floors and five bars, the Met’s vast size is exciting and terrifying in equal parts. The Beat Megaclub (677 Ann Street, Fortitude Valley) is Brisbane’s biggest LGBT+ nightclub, having rocked Fortitude Valley since its opening in 1983. If you think the Met sounded big, check this out: five nightclubs, six beer gardens and seven bars, all on one premises. It really justifies the ‘megaclub’ name. You are actually able to party there a full 365 days a year, if you ever wanted to do that. Lefty’s Old Time Music Hall (15 Caxton Street) is suitably left field. Just in case you wanted something completely different, we’ve thrown it in. If you’re missing your American homeland (and the 19th century) then Lefty’s is the place for you. Enjoy beer and whisky within the confines of a lovely, heritage-listed building. The honky-tonk saloon vibes will transport you back to the Old West and for a moment make you utterly forget that you’re actually in the east of Australia. Explore your taste for rum in the upstairs Mermaid Lounge with a range of over 70 rums on offer. If you’re feeling dubious about it all, be aware that they also offer free popcorn. No need to fear for your safety in Brisbane. Numbeo describes the level of crime in the city as ‘low’, with a score of 34.21/100. Additionally, the score for ‘safety while walking during daylight’ is 84.88, which is very high. The Slow Natives by Thea Astley – a beautiful novel that captures the joys and troubles of very ordinary life, set in Brisbane. Johnno by David Malouf – the famous debut novel from Malouf that brings 1940s wartime Brisbane to vivid and entertaining life. Brisbane: Then and Now by Helen Gregory – explore the dramatic changes that have taken place to the Brisbane cityscape over the past century through a series of historical photos. Brisbane by Matthew Condon – the author writes about his hometown of Brisbane with engaging warmth and fascinating detail.